So here we are, in our 16th year, still doing our best to make a difference to the lives of young people in poor Himalayan communities in India and Nepal. We can be proud of what we have achieved with your help over these years, with new school buildings and classrooms constructed with your donations, young students being helped through their education with your sponsorship money, and standards of English in village schools being raised through the efforts of our volunteer teachers, and our teacher trainer, Barbara Porter. My own visit to Ladakh was the first for several years, and it was good to return. Ladakh is a fabulous place, and I would recommend it to anyone wondering where to visit.The capital, Leh, has become larger and busier since I was last there, and innumerable family run guest houses have sprung up catering to the rapidly growing tourist trade. It’s always good to meet our volunteers and ex-volunteers, on these visits, and this year I had the pleasure of meeting Kelly Klein who taught at the monastery school in Phyang in 2013. She so loved the place that she has made Ladakh her home and currently runs teacher training sessions for local teachers in some of the Buddhist monastery schools. With the growth of the tourist industry, which offers young people new opportunities to make a living, Ladakhi monasteries are finding it increasingly difficult to recruit young monks. This trend bodes ill for the future of Buddhism in this remote part of India. What have we achieved this year with your help? This is perhaps the most important thing we do: raising the teaching skills of the local English teachers. 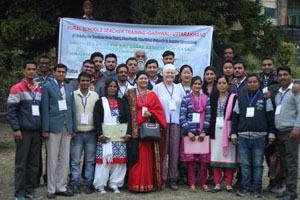 During her February inspection visit, my indefatigable fellow director, Barbara Porter, conducted a three day teacher training seminar in Dehra Dun (capital of the Indian state of Uttrakhand) for 23 participants from fifteen remote rural schools. These teachers had never been exposed to training of any kind and were enthusiastic about the experience. This teacher training seminar was conducted in collaboration with the Serve and Share Association (SASA), a locally based NGO, which has subsequently run follow-up visits to the participants’ schools. To cover the living costs of the participants at Barbara’s seminar, and also Jyoti David’s follow-up work in July, HELP contributed £1850. Barbara also conducted some short informal sessions with teachers in the schools we support in Kalimpong, and Sikkim. The teachers in these schools are currently following a very rigorous and demanding government teacher training programme. Teachers in these schools felt burdened by the demands and nervous of the outcome so it was particularly satisfying to be able to support them in this way. Many stimulating discussions were held covering a wide range of topics relating to teaching and learning. 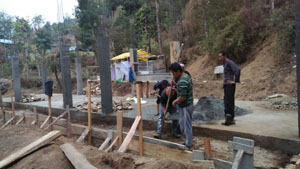 In West Sikkim, the volunteer Sophie Hudson was able to continue with the teaching support. 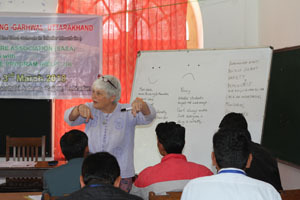 Next year Barbara will be returning to Uttarakhand to deliver the training to about 20 teachers from a number of different remote rural schools. We will once again fund some follow up activities. In addition, she will visit other schools in the areas where we work to deliver shorter, less formal sessions. It is encouraging to see, little by little, the positive impact on morale and teaching practices that such sessions can have. 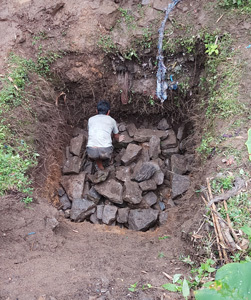 We have had to dig into our savings to maintain our programme of projects this year. We continue to support this local NGO with grants and sponsorships. This year we sent £1100 to cover the rent of their safe house, and also to enable them to run an advanced sewing course for the women under its wing. I have written in the past about a young lady who had been badly abused and burnt by her father. We have supplemented the money sent to us by her sponsors over the past three years with a grant of £1000 to enable her to clear all her debts with the nursing college she was attending. She is now qualified to practice as a nurse. We donated £1030 to this school for 25 badly needed desk/bench sets. With the old desks, the children had to contort themselves to sit and write, and if one child in a row of four got up the desk often toppled over disrupting the whole class! We donated £500 to the school to install a new toilet. I reported in our last newsletter that the work on the new classroom largely funded by ex-volunteer Liam Campbell had commenced. 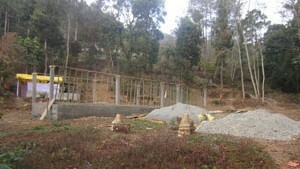 Here are the latest photos I have of the construction work. 2018 was a very disappointing year for volunteer recruitment. Over the 16 years of our operation, we have averaged around twelve volunteers a year. For some reason, this year we only managed to recruit two! I am not sure why there has been such a sudden drop in applications. It could be something to do with Google changing its algorithms since we don’t appear as high up in the search listings as we used to. The growth in the so-called ‘voluntourism’ business, with travel agencies competing to advertise short-term volunteer opportunities as part of an adventure holiday package, may also have made it more difficult to make a small charity such as HELP stand out from the crowd. Whatever the reason for this sudden drop in applications, it has a negative impact on our finances since we rely on the fees volunteers pay us for much of the money available to support school projects. It also means we have less money available to cover our running costs, including advertising, which puts us in a bit of a vicious circle. With a minimal advertising budget, we are going to have to work harder at raising our profile in other ways. Many thanks to those of you who sent reviews to GoAbroad, which is a platform we use to raise our profile. Any help that the readers of this newsletter can give us in spreading the word about HELP would be welcome! The two volunteers who did go to India made valued contributions to their schools. 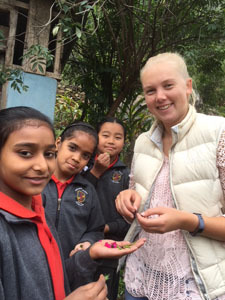 Sophie Hudson, went to the Vidya Sagar Gyanpeeth primary school in west Sikkim. This is always a popular assignment, and she has written about her experiences in our blog. Read what she has to say here. Volunteer Marco Saaltink returned to Nepal again! 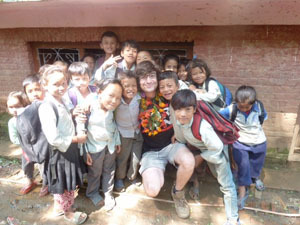 Marco Saaltink, who volunteered for HELP in Nepal in 2014 and 2017, returned once again in 2018, staying again at the school he was at in 2017 and kindly gathering some invaluable local information for HELP. He has written this article for our blog. Our sponsorship programme is a direct way to support money-strapped families by allowing them to send their children to small private schools that can provide their kids with an education far better than the decrepit public school system. Not all sponsored kids go on to academic success and high-flying careers, because in the interests of equity we do not shortlist based on academic ability. The number is always fluctuating, but currently we have 38 sponsors supporting 52 kids. Sponsorships are long-term in nature, and require staying power on the part of the sponsor. Many thanks to all our sponsors for staying the course for so many years for very little in return. We do our best to keep sponsors up-to-date, but the children are scattered all over the place, and so it is no easy task to track them down, and get them to write letters (an impossible task in a few cases). If you feel you are not getting as much information as you would like or expect, please let Ben Coleman know and he will do his best to get some news for you. My special thanks to our unsung heroes, our HELP Representatives: Norong Namchyo, Ghana Koirala, Pradip Bajracharya, Rabin Acharya, and Jayanti Bai Lama for the difficult task of running the sponsorship programme on the ground. We continue to rely mainly on volunteer fees to fund our programme, and of course donations our friends send our way from time to time. As I have said already, the fall in the number of volunteers we placed this year meant that we had to struggle to maintain the level of our grants to schools. A very special thanks, therefore, to the Community of the Presentation, a Canterbury based charity, which stepped in to give us a grant of £1000. Take up a charity challenge! This is me reaching 4960 metres on a trek I did in Ladakh, which was quite a struggle for me. If you are planning to do something that you find challenging, then please don’t miss the opportunity to invite friends to sponsor you through our BT MyDonate page! British friends who are not into challenges, can raise money for HELP without any effort at all! Easyfundraising is proving to be a valuable way of raising money by internet shopping. A gallant five friends (including me!) have raised £305 this year. Thanks to my recent appeal, three more of our friends have signed up bringing the total to eight. That’s still a very tiny number! Do please consider doing your online Christmas shopping via Easyfundraising! You can also book your holidays and flights this way. It’s an easy and painless way to raise money for HELP. HELP has an active Facebook page. This is an easy way for you to check up on what we are doing throughout the year, and to share thoughts with other friends of HELP. Do please befriend HELP and help to raise our profile! For more in-depth information visit our blog, where you can find all our volunteer testimonials, and reports on our inspection visits, as well as geo-political news affecting our work. Well, that’s it for this year. Many thanks for all your support and good wishes. Merry Christmas to all of you, and a happy new year! HELP isn’t a an introduction agency, or is it?! 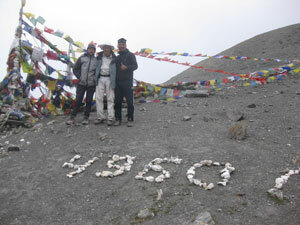 Time to volunteer in Ladakh! Come and join us as a volunteer teacher! 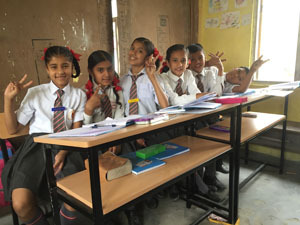 By becoming a HELP volunteer in India or Nepal you will be able to make a direct, personal contribution to the education of young Himalayan people. In so doing, you will be having an unforgettable experience in a new and fascinating world. I think HELP is the volunteer organization that I looked for for a long time. It is the most easily accessible and responsive organization I found on the web. I really like the self donation to the school and how independent it requires its volunteers to be, unlike many other organizations. I think it’s a great organization. I’m really impressed with how small and focused on each project HELP is. HELP is rare for an organisation offering volunteer teaching in that it puts the needs of the local people before the desires of the western person wanting ‘the experience’. Volunteering with HELP offers all the good things of working with a small, personal organisation: in-depth local knowledge from the HELP organisers, and the feeling that one is doing something for the first time. I want to let you know that I have looked at a lot of volunteer organizations since I did your program and you have (as far as I can tell) one of the best. I really like how much you personally care about each volunteer and each school.